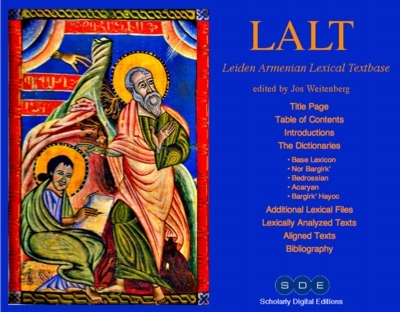 This textbase is designed to provide basic tools, in the form of texts and lexica, for the study of Armenian from the classical period, with a focus on the oldest states of the language. For texts: the textbase contains Biblical and theological translations and native texts up to the time of Movses Xorenats'i in the late eighth century. Every word in these texts has been lexically analyzed, for its dictionary form and part of speech, and is searchable on each of these. 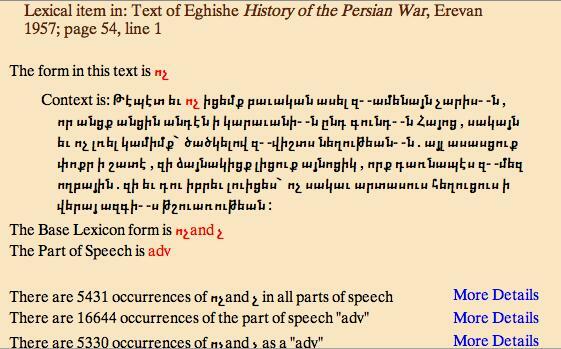 For lexica: four major Armenian dictionaries have been included, complete or in substantial excerpts. Together, these cover the complete range of the classical language down to the latest periods. 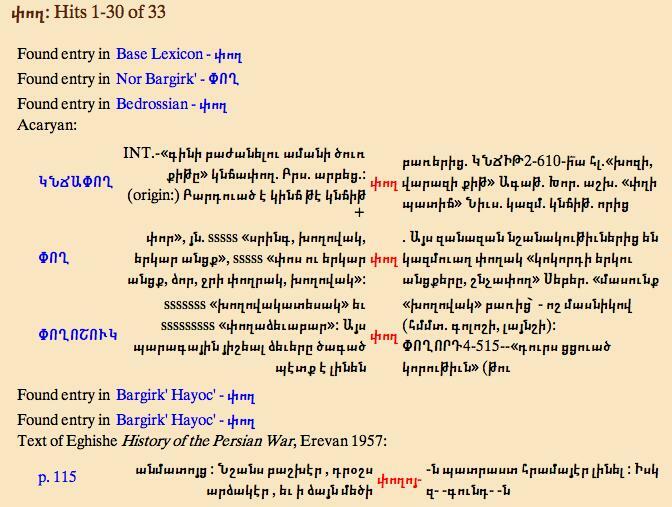 The four lexica are supplemented by Greek and Armenian wordlists. Uniquely, all words of all texts and all entries in every dictionary have been linked together through a 'base lexicon' which allows readers to find every occurrence of every word throughout. 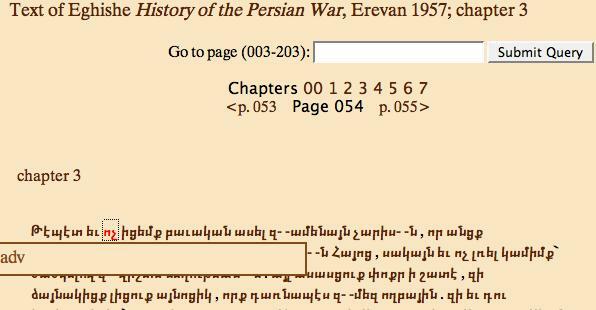 Full text of classic native works: Koriwn (the biography by this author on Mashtots', the inventor of the Armenian alphabet), the "History" of Agat'angeghos (concerning the christianization of Armenia), Eznik's theological treatise, commonly called "Against the Sects"; the "History of the Persian War" by Eghishe; Movses Xorenats'i's "History of Armenia"
The Base Armenian Lexicon lists every distinct Armenian head word form identified within the lexica and texts included in the textbase: 74943 forms in all. Similarly, the Base Greek Lexicon lists every distinct Greek form identified within the textbase: 20196 entries in all. Sponsored and supported by: The University of Leiden; the Netherlands Institute of Advanced Studies (Wassenaar); the Dutch Research Organization (NWO). This publication is available only by internet subscription.